> Max > Bad Mommy?? 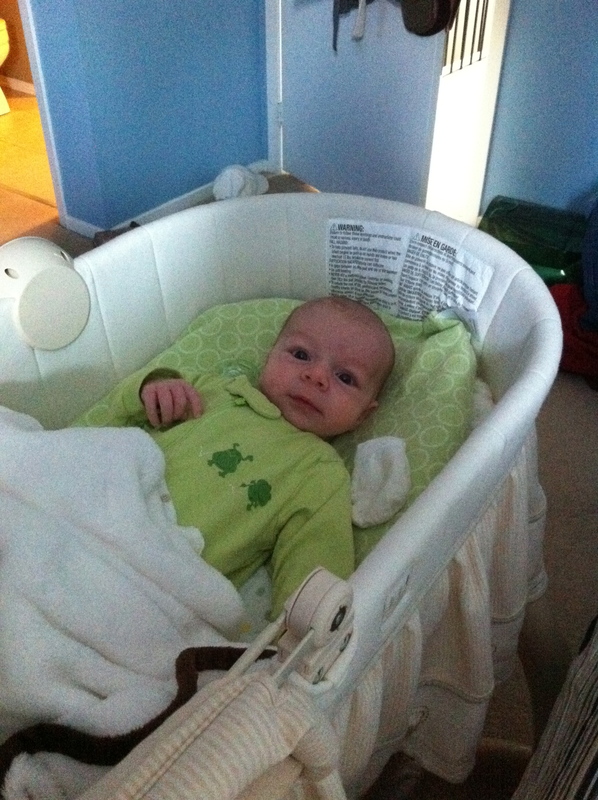 4) After milk drunk: place in bassinet and walk away/go to bed myself. I have had almost zero problems with him going to bed. He does nap a bit I would say anytime from 8pm-10pm, but it isn’t consistent. For example last night he wanted to play and was content sitting in his bouncy chair “talking” to Mom and Dad. I have tried to put him in his bed after the 8pm feeding, but he doesn’t like that and cries. I do not give him a bad every day as his skin is like mine and is prone to being dry. Obviously if he shits his pants, he gets a bath. I have not started story time with him yet, but I am going to get on that soon. I am guessing I am feeling bad because I am hearing that some people spend hours with their babies at night time with a ‘bed time routine’. I know very well that once Max is a bit older, we will have a routine as once he starts moving around and eating solids, daily baths and story time will be necessary (JAM HANDS!!!). I do not have a solid routine during the day. Our mornings are pretty set. We wake up around 6am-7am (sometimes earlier, never later than 7 as I won’t let him go that long). I feed him, change him and he goes down for another snooze til about 10am (it is 9:30am now and he is stirring, but not awake yet). After that…..no routine. I do try and do something in the afternoon via the stroller or car to try and get him to sleep. He refuses to lie down in his bassinet during the day, which is just silly considering I have zero problems at night. He will nap in his car seat (meaning we are out…I do not put him in the car seat in the house), stroller and sometimes bouncy chair. Anyhoo….speaking of sleeping, Max is up….lates! How old is Max now? I think bedtime routines develop overtime. Your routine currently sounds like a fine one. Yes, some parents spend hours getting their children to sleep – but that’s because they have to, not want to. If what you have isn’t broken, don’t fix it, I say!